Here at Ipswich Cats Protection we don’t just look after the cute and the cuddly puss cats, we deal with ones society has rejected. The lost, the stray, the abandoned and those born feral. We at Ipswich Cats Protection are one of the few charities in the area that will deal with feral cats. Thesey are not to be confused with your cat curled up in your lap or stretched out in front of the fire. They are not wild but still a domesticated cat, the difference is they don’t mix with humans, they have an innate fear of people though some may come to trust ‘the hand that feeds them’, to a degree. We are called to unneutered male cats that are fighting people’s pets, giving rise to hundreds of £’s of vets bills, they will go into homes and spray that pungent urine or will give plenty of unwanted attention to female cats. A neutered cat is a far happier cat, females are not regularly in season pitifully calling for a mate and males are far less aggressive and territorial. A neutered cat helps lessen the spread of FIV, as the main cause of spread is mating and fighting. We have been asked to trap many females with kittens this year, most of the queens have been former pets, some can be taught how to live in a home again but sadly many cannot so are fated to a life on the streets. The feral born kittens are kept if young enough for us to socialise (provided we have the space resources to do so) otherwise they are trapped at twelve weeks of age to be neutered and returned to where they came from. In the past two months we have dealt with 25 reports of problem cats, captured 40 animals, neutered 39 and sadly euthanised one. We do not seek to relocate feral cats, we cannot hold onto them as it is very stressful for them as well as very time consuming for us as we only have one trapping officer despite several recruitment drives. 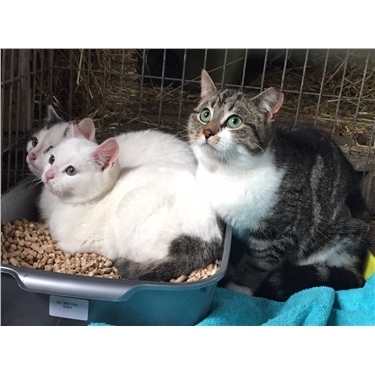 However, in this two months we actually have relocated nine cats, two went to stables in Cambridgeshire (the slow worm eaters) and three went to a smallholding close to Stowmarket from a housing estate in Felixstowe. Three more, a big sister and two younger brothers were taken in by a stable near Southend (pictured above) and finally a brother and sister were taken to a wonderful ‘country pile’ in Essex from Felixstowe Docks. We do try to find more suitable homes for those in desperate need, or, of course we will home them if we are asked to provide ‘mousers’ for rural locations. We receive no financial remuneration but rely upon fundraising and donations to enable us to continue this work. This work goes on unsung, unheralded and can be very sad, the females are hardly adults yet can be on their second or third litters. The males are bloodied and scarred, they compete for food, they steal from houses, eat bird food when they are desperately hungry and then when winter comes many will freeze to death. Please think about getting your cat neutered and stop this dreadful cycle, why not get a microchip at the same time? We have scanned so many cats without chips, they are clearly lost pets, but they end up being rehomed as the owner just cannot be traced. We are holding free neutering registration events in December 2018 both in Ipswich and Felixstowe (details on our website and Facebook) for those on low income. Do please ask the vet to chip at the same time, it’ll cost less than £20 for a lifetime of peace of mind. Just think of all the unwanted cats and those thousands of cats without homes because they weren’t neutered and chipped.